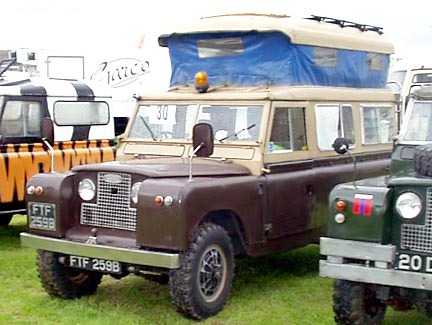 Park-Rangers are Land Rover based camper conversions manufactured by Hall Park Garage Ltd. of Berkhamsted, Herts. Years of manufacture are unknown but from the brochure pictures they include early through late 1960's. The black & white pictures illustrating this page come from a single brochure with low resolution newspaper quality pictures. The colour pictures are from later Park-Rangers. The Park-Ranger's distinctive splitting roof is illustrated in the factory brochure. However it appears that this style of roof was abandoned early in production and replaced by fiber glass roofs that raise up horizontally. 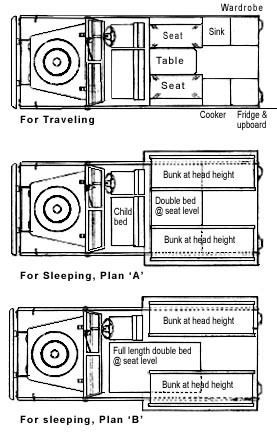 Park - Ranger conversions were available in two different 4 berth layouts (In layout B the berths are 4 feet long & therefore young child's berths). 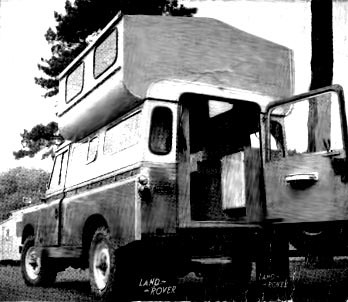 The brochure shows Park-Ranger conversions based upon the 109 two door Land Rover and says that conversions based upon the 88 will be fourth coming. I have not heard of any 88 based versions actually built. It should also be noted that most or all were built to order with hand made cabinetry and currently available fixtures, so it is possible that the interior features, while built on layout plan A or plan B may be unique to each Park Ranger. 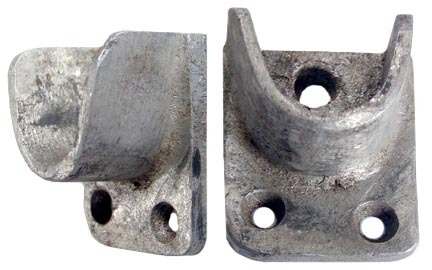 Patented nylon/PVC rot proof material with tubular support fame. Plastic sink with pumped water supply and exterior drainage. 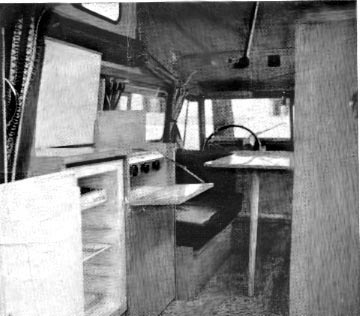 NOTE: The Park Ranger illustrated in the brochure has the rear interior furniture installed on opposite sides (mirrored) from the plan A interior illustrated above and the Park Ranger pictured below. I flipped the brochure interior images horizontally to create an easier visual comparison between the floor plan diagram and the later park Ranger shown below. 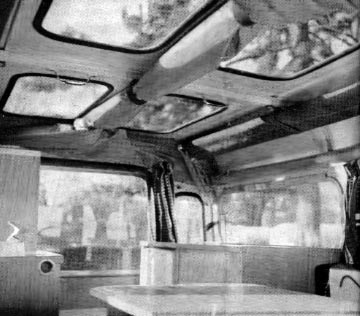 So obviously at least one Park Ranger was built with an interior mirrored to the layout plan. Interior with early top down. The roof fabric fits inside under the middle and is held rolled up by straps. 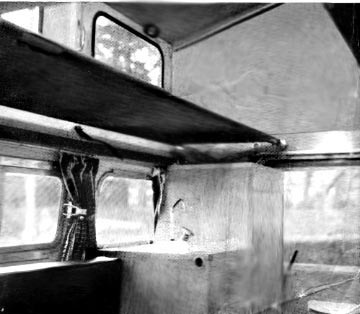 Think of a Dormobile top with 4 roof windows cut lengthwise down the middle and hinged on both sides. When open the roof windows become vertical side windows and the rolled canvas becomes the roof held in a shallow peak by tubing. Wardrobe is in the left rear corner with the sink stand just forward of it. Forward of the sink stand is a double wide side facing seat. All the furniture is constructed of oak and formica. At the right rear is the fitted cupboard with the optional refrigerator installed. Forward of that is the stove stand with the Calor 2 burner cooker and broiler. Additional storage is below the cooker. The sink is opposite the cooker. You can see the table erected between the two double wide side facing seats. There is limited additional storage under the side seat cushions. between the body side bench and the wood. Rear view with early top erected. The standard top bunks are cot type with poles that drop into custom aluminum brackets screwed into the front and rear vertical wood sections of the pop up assembly. The Park Ranger, like its Dormobile cousin tries to stuff a lot of full size caravan features into an approximate 4 foot by 6 foot rear interior space. As a result storage space gets skimped on. If you wish for longer than a holiday weekend get away a trailer would come in handy. If you have any additional information about Park - Rangers, pictures or brochures that you could send high grade photocopies of please contact me so that I can make this page more complete. Thanks. 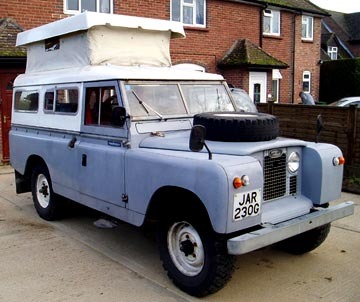 This is a 1968 Park-Ranger Land Rover Caravan imported from the UK to California in 2004. The interior of this vehicle fits the brochure layout for type A sleeping arrangements. Additional pictures of this vehicle. 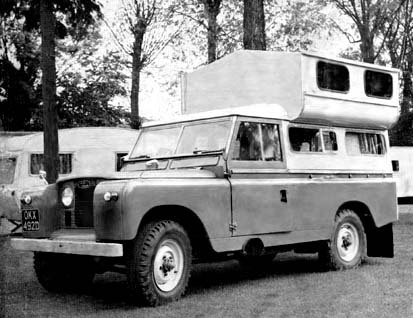 This is a 1964 Park-Ranger Land Rover the UK. Caravan conversion manufacturer stickers are absent. I've tentivly classified it as a Park-Ranger based upon its standard Park-Ranger interior layout.